The Chesapeake Bay Program is a unique regional partnership that brings together leaders and experts from a vast range of agencies and organizations. Each Bay Program partner uses its own resources to implement Bay restoration and protection activities. Partners work together through the Bay Program's goal teams, workgroups and committees to collaborate, share information and set goals. 5. Pee­ring into the futu­re of the Bays blue crabs How war­mer wa­ters and increa­sed aci­dity could im­pact the sig­natu­re crusta­cean /news/blog/from_the_field_could_blue_crabs_weat­her_a_chan..
6. Set­ting sail to­get­her Uni­ver­sal Sai­ling Club con­nects Afri­can-Ameri­cans with their lo­cal wa­ter­ways /news/blog/uni­ver­sal_sai­ling_club_sup­ports_afri­can_ameri..
8. Pictu­re of Pho­to of the Week Kee­ping an eye on herita­ge breeds /news/blog/photo_of_the_week_kee­ping_an_eye_on_herita­ge_..
9. A history les­son on the Na­tions Ri­ver Time tra­vel a­long the Poto­mac at the­se six river­si­de sites /news/blog/travel_back_in_time_at_these_six_histori­cal_po.. In total 12 links were found which refer to Chesapeakebay.net. The most used keywords in text links are Chesapeake bay Program and Chesapeake. Individual words like Program, Quality, Conditions and Eyes are frequently used in text links from other websites. The most important link sources for this website are Baygateways.net and Ccgov.org. The homepage of Chesapeakebay.net and the subsite /eyesonthebay/index.cfm are most referenced by other websites. The table shows the most important links to Chesapeakebay.net. The table is sorted in descending order by importance. The table shows websites of Chesapeakebay.net, which are often linked by other websites and therefore they are classified as important content. three profiles were found for Chesapeakebay.net in social networks. Among other social networks the website is represented in Facebook, Twitter and YouTube. The web server with the IP-address 52.203.101.221 used by Chesapeakebay.net is owned by E.I. du Pont de Nemours and Co. and is located in Wilmington, USA. The website Chesapeakebay.net has a own web server. The web server only runs this website. 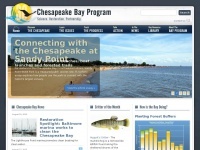 The websites of Chesapeakebay.net are hosted by a Apache server and were developed in the programming language PHP. The HTML pages were created with the latest standard HTML 5. The visitor analysis software Google Analytics is used to analyze the visitors of the websites. The website does not specify details about the inclusion of its content in search engines. For this reason the content will be included by search engines.